The Boston Tea Party Ships and Museum will give you a comprehensive look into the days leading up to December 16, 1773, as well as this fateful day’s role in kick-starting the American Revolution. The museum combines historic and rare artifacts with cutting-edge technology to give you a real-life experience of what life was like in Boston during the 18th century. Spend your day wandering the museum and the exhibits at your leisure, or take advantage of the complimentary, one hour guided tours that leave every 30 minutes! Museum exhibits include: The Meeting House:See a reenactment of the evening of December 16, 1773, when patriots dumped the loads of British tea into the Boston Harbor. The Tea Party Ships:Explore one of the tall ships: The Beaver, The Dartmouth and The Eleanor! Two of the three (The Beaver and The Eleanor) were docked in the harbor on the evening of the Boston Tea Party! 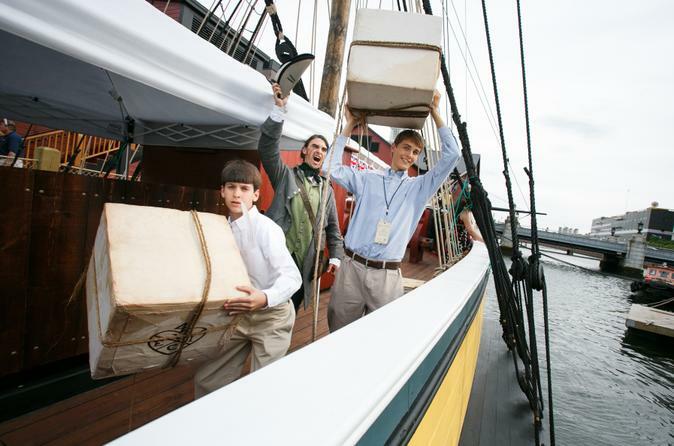 Griffin's Wharf: At Griffin's Wharf, take pictures with colonial cutouts and mingle with costumed patriots. The wharf played a crucial role in the Boston Tea Party protests and is a perfect place for photos of the tall ships and the Boston Harbor. Holographic Tea Party Encounter: Enjoy a 3D experience that will make you feel as if you are on a Boston street watching colonists and British soldiers argue right before your eyes! Robinson Half Chest: See one of the two remaining tea chests! This artifact, passed down from generation to generation, is one of two chests that survived the Boston Tea Party. Minuteman Theatre: Watch the American Revolution unfold before you on the big screen! Abigail's Tea Room: Quench your thirst at Abigail's Tea Room and enjoy a spot of tea (tasting not included). You'll also learn about the tea-brewing process.